ONE NIGHT ONLY! Shopped til you could drop? Had it with endless lists and dreadful office parties? 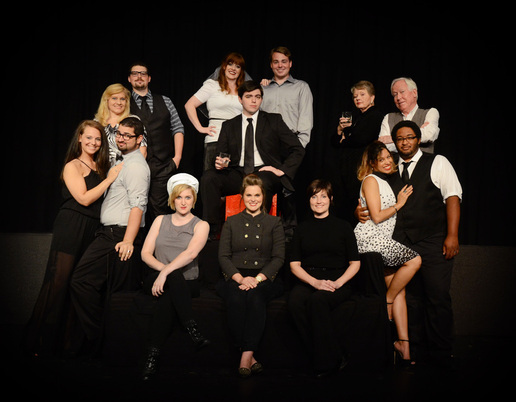 Fondren Theatre Workshop is serving up the antedote with an old-school, Vegas variety style holiday review. Think Frank, Sammy, and Dean at The Sands with eggnog. Our lineup of songs, sketches, and stand-up is Santa-approved, but with just a dash of naughty added to the nice! Admission is $10.00 per person; seating is strictly limited, so get your tickets now! Full bar service available during the show, but plan to make an evening of it by enjoying a terrific dinner before or after the show in Scrooges main dining room. COME PLAY WITH US! Welcome to Winters, TX, where three generations of a wacky family have gathered for the funeral of their matriarch, Peggy, an otherwise "fine upstanding woman" who's died under rather sordid circumstances involving a motel room and a pair of wooden legs. 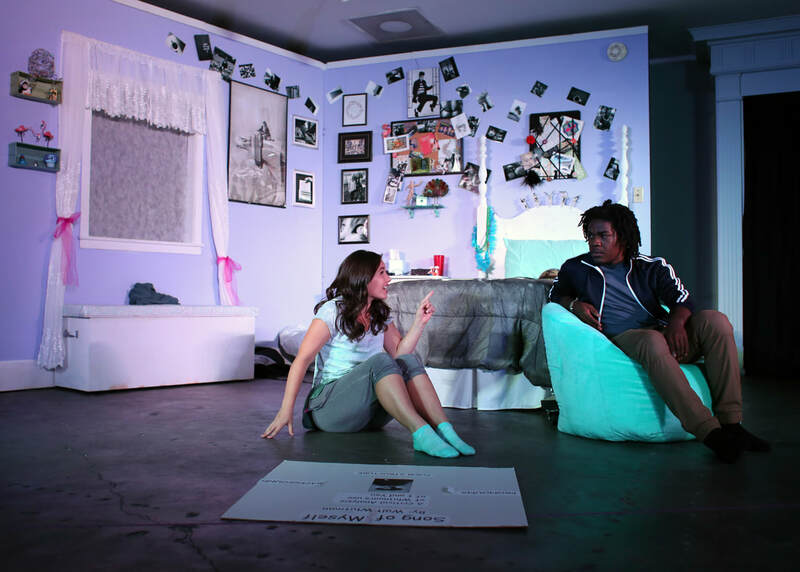 By turns both poignant and irreverently hilarious,the play reveals a family at their worst and their best as they come to grips with their grief, their secrets, and each other. 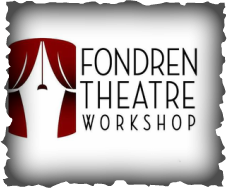 Fondren Theatre Workshop will present this Southern-fried, bawdy "black comedy about white trash," by the author of "Daddy's Dyin', Who's Got the Will?". Shores' original play received more than 30 award nominations, and was adapted into a 2000 film starring Delta Burke, Beau Bridges, and Emmy-winner Leslie Jordan of "Will & Grace," which gained a cult following status, resulting in a subsequent 2008 television series and a just-released film sequel, "A Very Sordid Wedding." The show will be presented "cabaret style" in the banquet room of Scrooge's Restaurant, 5829 Ridgewood Road, in Jackson, MS. Audiences are encouraged to make an evening of it by dining pre-show at Scrooge's; beverage service will be available pre-show and during intermission. Tickets will be $22-$25 and will be available May 1 at www.ftwsordid.brownpapertickets.com. A portion of proceeds will benefit the MS Human Rights Campaign. Seating will be strictly limited, so pre-purchasing via brownpapertickets.com is STRONGLY encouraged (Visa/MC required). Please call FTW at 601-301-2281 for more information. 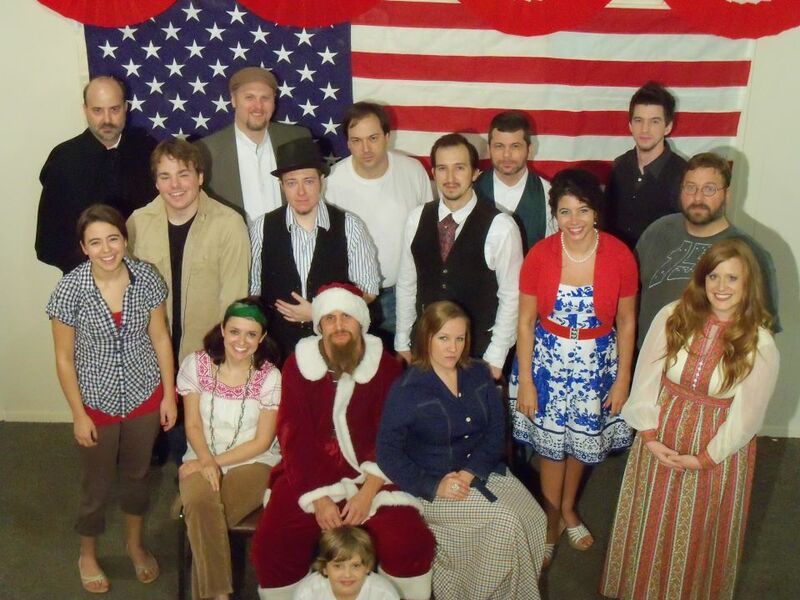 (Please do NOT call Scrooge's for tickets/info as this is strictly an FTW production.) You can find us on Facebook under Non-Profit Organizations. The play is directed by Diana Howell. Actors include Opie Cooper as G.W. Nethercott, a cheatin’ husband with two wooden legs; Deenie Castleberry as Noleta, G.W.’s spurned wife who goes on a rampage; Lynn Campbell, playing the long-suffering aunt Sissy, who picked the wrong day to quit smoking; Mandy Kate Myers and Claire Kinsey as Latrelle and Lavonda, two polar-opposite sisters who are feuding over their dead mother’s mink stole; Jane Waugh as Juanita, the perennial barfly; Malaika Quarterman as the barely-stable-herself psychiatrist Dr. Eve Bolinger; Erick Weeks as Earl "Brother Boy" Ingram, the cross-dressing Tammy Wynette fanatic who’s spent 23 years at the state hospital for "dehomosexualization" therapy; David Waugh and J.C. Patterson as bar-owning brothers Wardell and Odell Owens; James Anderson as preacher Barnes; Roxie Hood as local saloon singer Bitsy Mae Harling; and Sam Furman as Ty Williamson, the prodigal grandson who’s struggling with whether to return home to face his family and his own demons. FOR MORE INFORMATION, CALL 601-301-2281. Please DO NOT call Scrooge's Restaurant. 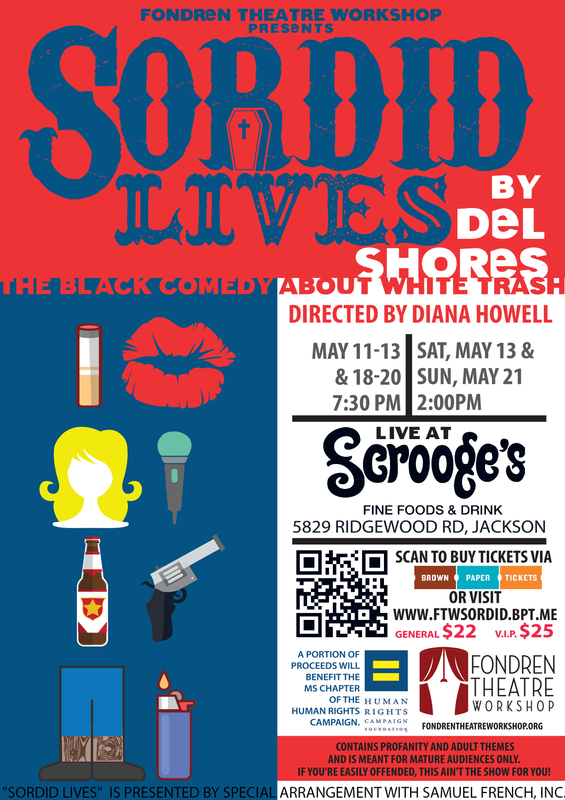 SORDID LIVES is presented through special arrangement with SAMUEL FRENCH, INC.
Sam Storm has been mayor of Anderson, Georgia, for two decades. Most of that time, he's run unopposed. But when he makes some misogynistic comments at a Stag Lodge meeting, his wife Sofia decides she's had enough and declares her own candidacy for mayor. Sparks fly, fueled by their respective uber-competitive campaign managers, J.B. and Liddie. But when an unexpected third candidate enters the mix, they're all thrown for a loop. This 2013 Eudora Welty New Play Award winning script is being produced by FONDREN THEATRE WORKSHOP in cooperation with UNFRAMED at New Stage Theatre. The show is directed by Scott Stinson, and features Betty Daugherty, Richard Lawrence, Amy Smith, Neill Kelly, David Moncreif, and Hope Prybylski. 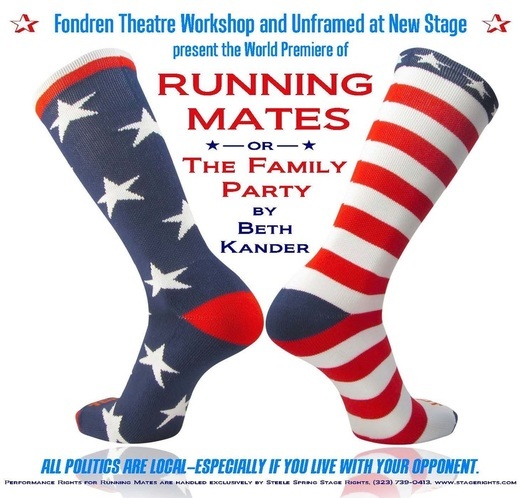 FEBRUARY 11-12-13-14 @ 7:30, with an additional Saturday matinee @ 2:30 on FEBRUARY 13, AT THE WAREHOUSE THEATRE, 1001 MONROE STREET, JACKSON, MS. ALL TICKETS ARE $14.00 AND ARE AVAILABLE IN ADVANCE AT www.runningmates.bpt.me OR AT THE BOX OFFICE, VISA/MC ACCPETED. FOR MORE INFORMATION, CALL 601-301-2281, OR VISIT OUR FACEBOOK PAGE AT https://www.facebook.com/events/427869564084342/. IT'S TIME WARP TIME, AGAIN!!! 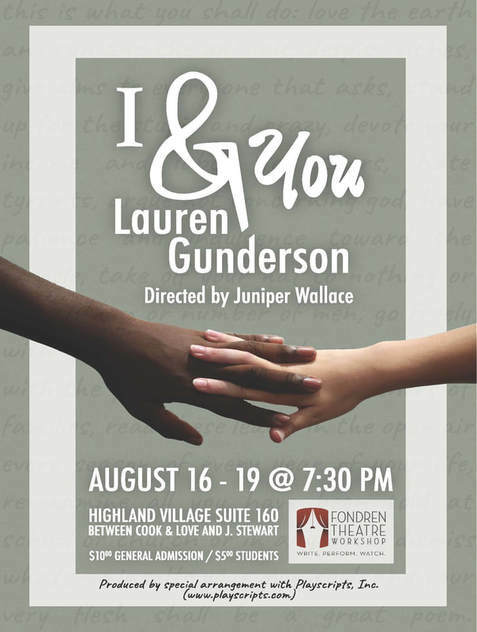 Direction: J. C. Patterson, assisted by Claire Mayronne; Musical Direction: Mandy Kate Myers; Choreography: Leslie Ann Harkins and Lynn Forney; Production & Costume Design: Darrell & Monique Troth; Makeup Design: Dustin King; Production Manager: Diana Howell. Fondren Theatre Workshop and Actor's Playhouse will present their co-production of Stephen Sondheim's Tony Award-winning musical, COMPANY, August 13-17, at Actor's Playhouse Theatre, 121 Paul Truitt Lane, in Pearl, MS. Tickets will go on sale July 15 via brownpapertickets.com, and will range in price between $15 and $20. Just in time for our late-arriving spring, we will have Shakespeare in Fondren Park! FTW presents William Shakespeare's THE WINTER'S TALE, May 15-16-17-18. Performances will be at 7:00 p.m. on Thursday, Friday, and Saturday, with 2:00 p.m. matinees on both Saturday and Sunday. Since it's in the park, please bring your own lawn chairs or blankets. The play is famous for its two-part structure, which makes "The Winter’s Tale" seem like two entirely different plays that are joined together at the end. The first three acts enact a mini-tragedy and occur in wintery Sicily, while the second half of the play occurs in Bohemia during the summer months and features the kind of restorative ending typical of Shakespeare’s comedies. 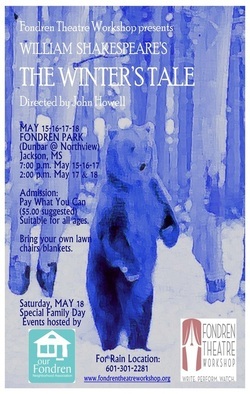 For this production, we are thrilled to partner with OurFondren Neighborhood Association, who will be hosting an entire slate of events on Saturday, May 18, featuring other local performers and free hotdogs and beverages. So bring your lawn chairs or blankets and other picnic supplies and make a day of it! THU, MAY 15, 7:00 P.M.
FRI, MAY 16, 7:00 P.M. SAT, MAY 17, 2:00 P.M. *AND* 7:00 P.M.
SUN, MAY 18, 2:00 P.M. ADMISSION IS BY DONATION ONLY--PAY WHAT YOU CAN OR WHAT YOU WILL--JUST BRING YOUR LAWN CHAIRS OR BLANKETS AND PICNIC SUPPLIES AND ENJOY! ﻿SUITABLE FOR AUDIENCES OF ALL AGES. RUN TIME APPROXIMATELY 2:30 INCLUDING INTERMISSION. 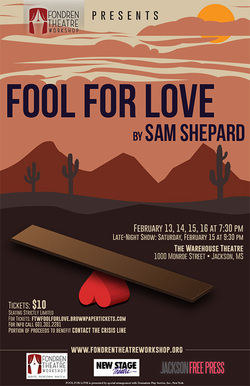 Just in time for Valentine's Day, Fondren Theatre Workshop presents Sam Shepard's acclaimed, Obie award-winning play, FOOL FOR LOVE, February 13-16 at 7:30 p.m. at The Warehouse Theatre, 1000 Monroe Street, Jackson, MS, with a bonus late-night showing at 9:30 p.m. on February 15. Tickets $10.00, available at the door, or at ftwfoolforlove.brownpapertickets.com. Seating strictly limited. For mature audiences. Portion of proceeds to benefit Contact the Crisis Line. For more information, call 601-301-2281. FOOL FOR LOVE is a modern Greek tragi-comedy centered around two angry and thwarted lovers, Eddie and May, in a run-down motel room on the edge of the Mojave desert. Sam Shepard's masterfully crafted piece is mysterious and unsettling, with "now you see it, now you don't" twists and turns between fantasy and reality. 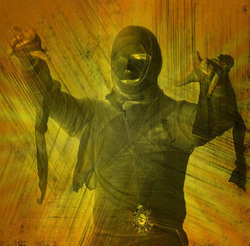 An intensely probing yet sharply humorous study of passion and destiny, FOOL FOR LOVE is a "punk-rock meets old west burst" of theatrical energy. Come hear some of your favorite local actors read some of their favorite scary stories and script selections, followed by a spooky social! Concessions, candy, and yes - there will be a costume contest (with prizes! ), so dress up and come out! OCTOBER 31, 2013 - 8 PM to 10 PM. WAREHOUSE THEATER. Admission: Suggested donation of $5, AND/OR bring a bag of dog food or cat food for Animal Rescue Fund of Mississippi (ARF) - we want the shelter pets to have a happy HOWL-O-WEEN, too! Their preferred pet food brands are Pedigree or Purina. Stories will include several original ghost stories, as well as classics from Poe, Morris (Willie, of course) - AND some Monster Monologues...! FTW Presents Beth Kander's SEE JANE QUIT, JULY 25-AUGUST 4, 2013! You can give up cigarettes. But you can't quit your crazy family. The Mississippi premiere of Beth Kander's addictive new comedy, SEE JANE QUIT, opens July 25 and runs through August 4th at The Warehouse Theatre, produced by Fondren Theatre Workshop! Jane, a neurotic waitress, needs to quit smoking. Her loved ones concur—so when she announces that she's quitting "for real," they’re supportive. In fact, they're a little TOO supportive. Each has a problem—from a looming divorce to a sexual crisis—and nobody wants to bring Jane any news that might lead her to quit quitting. With all these secrets floating around, who would suspect that Jane is keeping the biggest secret of all? Featuring Malaika Quarterman, Deja Abdul-Haqq, Juniper Wallace, Michael Kinslow, Matt Faries, Monte West, and James Wood. Directed by Diana Howell. PERFORMANCES ARE JULY 25-28 and AUGUST 1-4, 2013. All shows at 7:30. Seating limited; to reserve call 601-301-2281. NOTE FROM THE DIRECTOR: We are only 4 rehearsals in, and I'm already laughing so hard it hurts...don't miss this show!!! See Jane Quit is presented by arrangement with Steele Spring Theatrical Licensing, and produced in partnership with New Stage Theatre and the New Stage Unframed series. JOIN US for a night of "Stars Under the Stars" at the beautiful home of Jane and David Waugh for FTW's 10th Anniversary Party -- a showcase night of songs and scenes highlighting the first ten years of Fondren Theatre Workshop, including excerpts from Through the Looking Glass, The Lion in Winter, Talking With, Vital Signs, American Buffalo, Sordid Lives, The Rocky Horror Show, The Mystery of Irma Vep, Cabaret, Assassins, and others. We’ll have our print and video scrapbooks on display, and encourage all FTW alumni to bring theirs to share, as well! NOTE: Some material may be suitable for Mature Audiences Only. ADMISSION $5.00 (to help defay food & beverage costs). LAWN CHAIRS AND BLANKETS ENCOURAGED! COME PLAY WITH US! From "Assassins" (cast pictured at left) to wholesome holiday shows, and everything in between, FTW shows run the gamut. We're not afraid to take some risks - but we'll always warn you ahead of time when there's any 'mature content'! Since 2003, we've offered a diverse array of shows. Plenty of original works: John Howell's musical "Through the Looking Glass" (our first show! ), John Webb's drama "The Sound of Steel," the upcoming production of John Maxwell's "Buck Nekkid for Jesus"... and also, yes, we DO consider new works NOT written by guys named John. 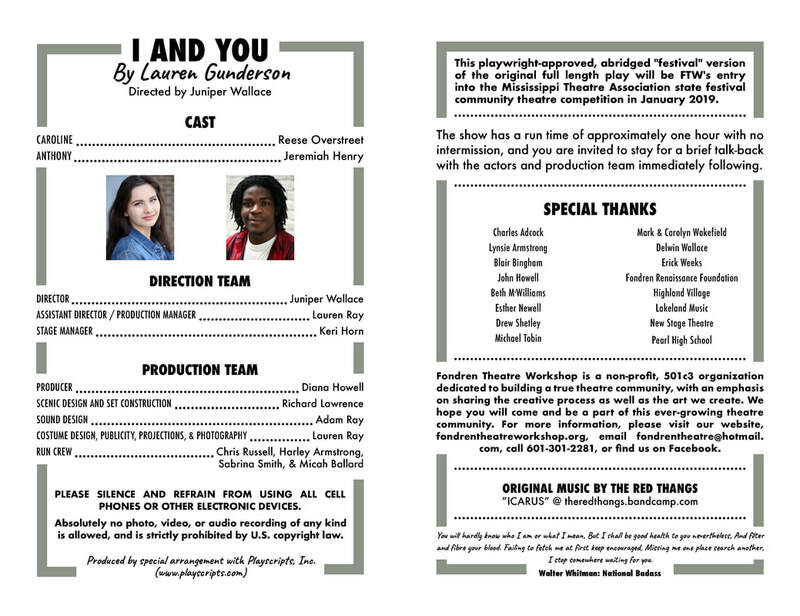 Check out our past production information below. What's your favorite? We can't pick! December 2017: "Holidays on the Rocks: An Evening of Comedy, Crooning, and Cocktails to Ease the Seasonal Malaise"